Struggling Avs send forward Tyson Jost and defenseman Ryan Graves north to AHL affiliate Colorado Eagles. The Colorado Avalanche had a tough five-game Canadian road trip and that's diminishing their on-ice woes. Over the last 10 days north of the border, the Avs only won a single game out of five, and from December to now they've lost 15 of their last 21 games. Tyson Jost, an Avs forward known for his ability to put the puck in the net, has 15 points (six goals, nine assists) in 43 games. In early January, Jost had two goals against the San Jose Sharks and he tacked on two assists in games following; however, the forward has zero points in the last three games with a minus-three rating. Colorado needs its other lines to get onto the score sheet...in a good way. Their juggernaut one-two-three punch from Nathan MacKinnon, Mikko Rantanen and Gabriel Landeskog has helped the team hold onto their wildcard position. The first line alone from December through their last game against Ottawa has combined for 79 points in 21 games (32 goals, 47 assists) and they also have a rating of plus eight. 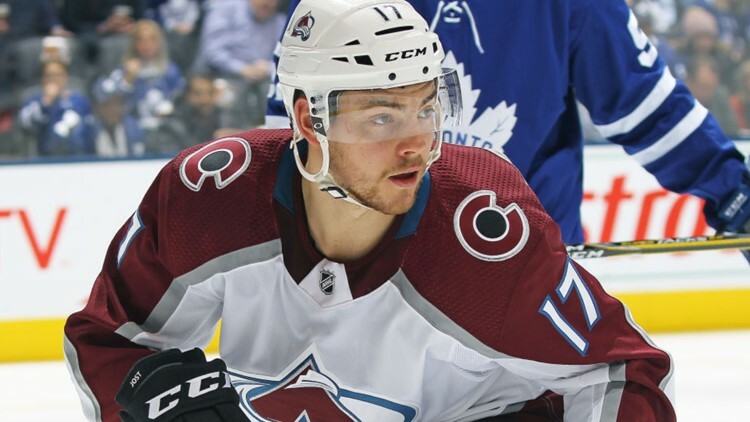 Trying to get some of his mojo back in the minor leagues, Jost will play up north in Loveland with the Avs' American Hockey League affiliate the Colorado Eagles. Defenseman Ryan Graves will also join Jost up north. Graves has posted two goals and six assists in 26 games with the Eagles so far this season and two goals in eight NHL games with Colorado.